Reg. the new tab placement, I want to note that - unlike in Firefox - there seems to be no way currently to move them back to where they were used to be, even though it's claimed in the description of the related bug report that it's possible via a custom "userChrome.css", but even after fiddling for quite some time with some CSS snippets I've found on the web upon further researching that and the DOM Inspector, I didn't manage to achieve that. 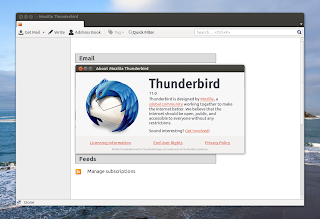 Thunderbird 11 can be installed in Ubuntu Lucid, Maverick and Natty from the 'Stable PPA'. If you have already added that PPA to your Software Sources, and you have Thunderbird already installed, all you need to do is to install the available updates via the Update Manager. Update 3/23/2012: Thunderbird 11 has now finally arrived in the official repos of Oneiric 11.10.